And another Winterdecoration is ready. 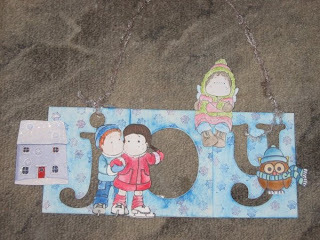 The background is colored with blue stampcolor and then I have stamped many little colored snowflakes. The images are cutted out and then I glued them on the letters. I've added a little winterhouse with 3D-Pads and then finally a fiber to hang it on the wall.